Study the auger components. Image courtesy Roadtec Inc., Chattanooga. Editor’s Note: In this training column, AsphaltPro helps asphalt companies teach new workers back-to-basics techniques for best success in the field, at the plant and in the lab. Even veteran employees will be reminded of best practices with these refreshers throughout the year, but the goal is to help readers who are bringing in new employees who may or may not be well-versed in the industry yet. On-the-job training takes time and energy, and we’re here to help with the Asphalt Paving 101 online training course and these free articles in each issue. How to set the height of augers was a vital lesson to include in the Asphalt Paving 101 online training course, which you find on the popular Teachable platform. The voice-over explains it. The pictures show it. The overall video discusses what to do. For those who haven’t shared this aspect of best paving practices with your new crewmembers yet, let’s look at the importance of setting the auger height and speed—and how to do both properly—to protect mat quality. First things first: do your paver and screed operators know what the head of material is? 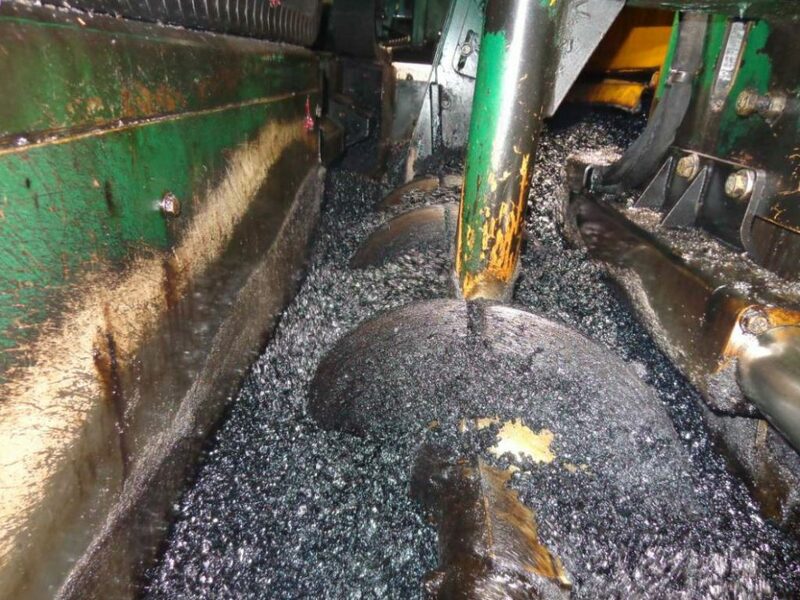 Within the auger chamber, the hot-mix asphalt (HMA) that has traveled from the hopper past the flow gates gets churned and moved by the augers to go under the screed. The mix in the auger chamber “becomes” the head of material. In a perfect world, mix height will remain consistently at the mid-point of the augers all the way across the length of the augers. You will have the augers extended to within six to 12 inches of the heated endgate. To achieve a consistent height for the head of material, all members of the crew have details to pay attention to. Those details include travel speed, which will influence the auger speed you set. Let’s take a look at all these moving parts to get auger height and speed set right. The two horizontal plates bolted in place at the “end” of the conveyors throw material into the augers. This encourages the mix to move around with the augers—rather than be pushed by the augers—and discourages larger aggregate from segregating off of the pile. Photo courtesy Roadtec Inc. Step 1: Check the condition of the augers for thickness and wear to ensure they’re about three quarters of an inch thick. Highway class paver augers will be 14 to 16 inches in diameter; commercial paver augers will be closer to 13 inches in diameter. Step 2: Use a ruler to measure from the bottom of the auger blade curl to the ground. You want the distance to be at least 1 inch, up to 2 inches, greater than the surface you’re going to match. If the surface you wish to place is 2 inches, then the distance, or space, needs to be 3 to 4 inches. The actual lifting or raising of the augers takes place via the lift cylinders. They are hydraulic, which means you won’t use a tool to unhook or unscrew anything to raise this segment. Instead, you’ll use a toggle switch on the screed operator’s pedestal—or control panel—to effect the cylinder’s movement up or down. 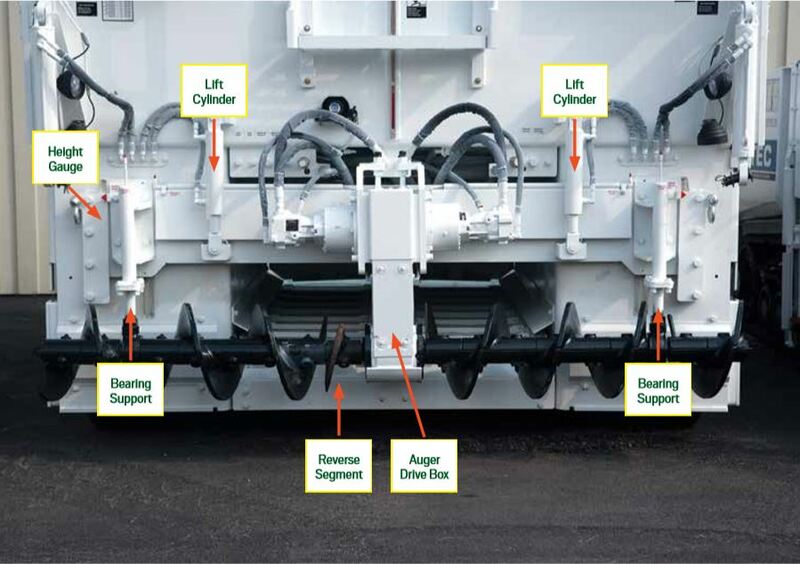 The auger drive box is typically at the center of the auger barrel, although the Cedarapids 600 series pavers replaced this structure with outboard auger drives to the far left and right. A spokesperson for BOMAG Americas, which now owns the 600 series pavers, stated the purpose of removing the center gearbox was to eliminate centerline segregation. The 600 series pavers feature the outboard auger drives to fine tune auger height. The 300, 400 and 500 series still have the traditional center gearbox. Both augers will move together. John Irvine, president of Roadtec Inc., Chattanooga, shared that Roadtec pavers offer an exclusive ability to tilt, to facilitate going into a transition running slope, building a wedge or other paving features that require the crew to offset one side or the other. As augers wear, they reduce from 16 inches to 15 or 14 ¾ inches, or they can break leaving a gap in the segment. There should be three curls from the center to the support bearing. Then we have half an auger outside that “shovels” mix to the endgate. Half-augers—also referred to as reverse augers—in the center were designed to help move mix into the center. That segment tends to wear rapidly. Check it at least every three months to ensure it’s ¾ inch thick and 8 inches long. If it’s starting to wear, get it replaced. Photo courtesy John Ball of Top Quality Paving. Look for your height indicator rod(s). You’ll see an indicator, but remember, it’s not necessarily marked in actual “inches” like a ruler on all paver makes and models. You may want to get a marker to put your own marks on this indicator. You want to double-check all settings with your ruler to be sure of position. The tunnel helps with confinement to keep mix from wrapping around the track and gearbox. Photo courtesy John Ball of Top Quality Paving. To set auger speed, you must first finalize the paving speed. That means you need to know how wide you’re paving, what depth you’re paving, and how many feet per minute you want to pave. Is it 25 feet per minute (fpm)? Thirty? If you slow down or speed up during the pull, that change in pace will change the height of material in the pile. 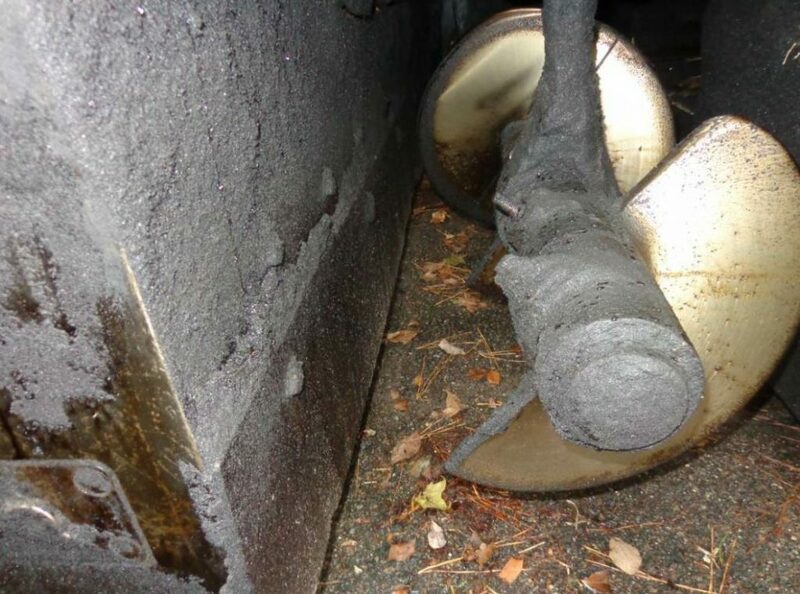 The way you dump the trucks affects paving speed, thus affecting the height of material in the auger chamber. The goal is to have material cover half-way up the augers (to the top of the auger shaft only). 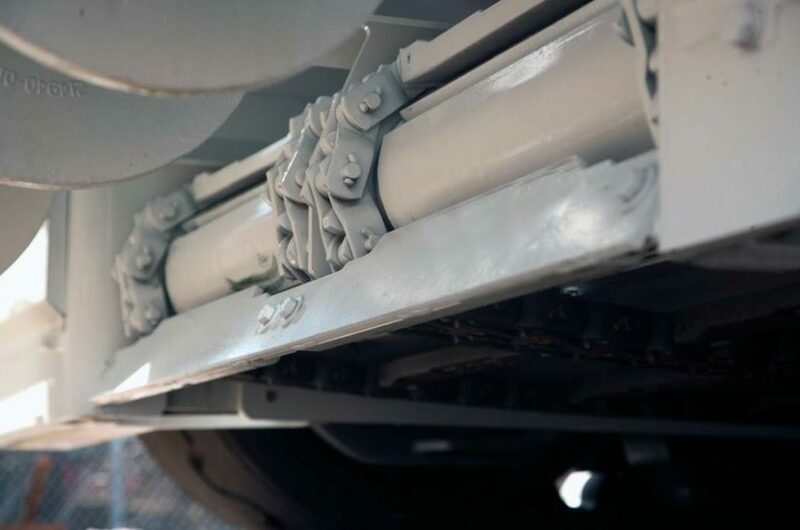 The engineers at Roadtec created a feature called the delta plate, which is affixed to both the left and right side of the back of the paver directly behind the slat conveyors, to direct material and push it right up against the auger. At the far left in this picture is a silver, vertical tube—this is a lift cylinder. The silver, horizontal line on the tube shows where they’ve made a mark, but that mark isn’t actual inches. 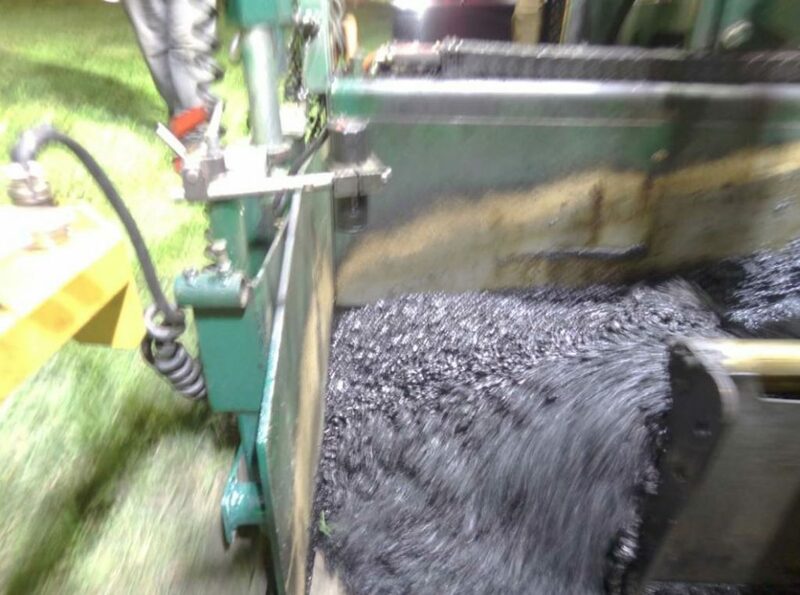 Photo courtesy John Ball of Top Quality Paving, Manchester, New Hampshire. With the augers turning 100 percent and material entering the auger box at a good flow, you’ll be able to establish a good head of material straight across the auger chamber. You don’t want to see a valley in one area and a pile by the endgates. You want a consistent, even head of material across the width of the auger chamber. Some paver manufacturers offer hopper gates as standard equipment to further adjust the height of the material halfway up on the augers; others allow operators to adjust the speed of the conveyor only. Be aware, if you see the augers starving for mix at the endgate, you don’t necessarily want to raise the hopper gate to deliver more mix. The team at Roadtec reminds operators that this will flood the center of the auger chamber with mix, which won’t allow efficient operation. This picture shows a reasonable head of material, but it’s not perfect. It’s not consistent all the way across, so it’s not ideal. Remember that the temperature of the mix will affect how the head of material changes, too. If the temperature fluctuates hotter or colder, it could have the material rise up a little bit or fall down a little bit. Photo courtesy John Ball of Top Quality Paving. To facilitate a consistent head of material, you must establish a consistent paving speed and dump trucks properly. Dump the trucks as a mass of material. Move the mix into the hopper as a mass of cascading material. Move the mix through the hopper and through the paver consistently so you don’t see the chains or gates; don’t let it run low so that you end up seeing a hole at the flow gates or the conveyors. To get the correct speed of the conveyors, you’ll pay attention to the feed sensors on your heated endgates. The feed sensors send a beam 14 to 18 times per second to “pick up” or read the head of material, helping you turn the augers at a certain speed. They help you keep the augers running 100 percent of the time. “The augers are running 100 percent of the time, but not at 100 miles per hour,” Ball said. As crewmembers become more at ease with the paving operation, keeping track of all these moving parts will become second nature to them. Getting the augers set at the right height is merely one step toward getting a good head of material to flow nicely, smoothly and at the right speed under the screed. By taking the time to train and work with new crewmembers, you’re taking the time to make bonus-worthy pavements next summer and into the future. 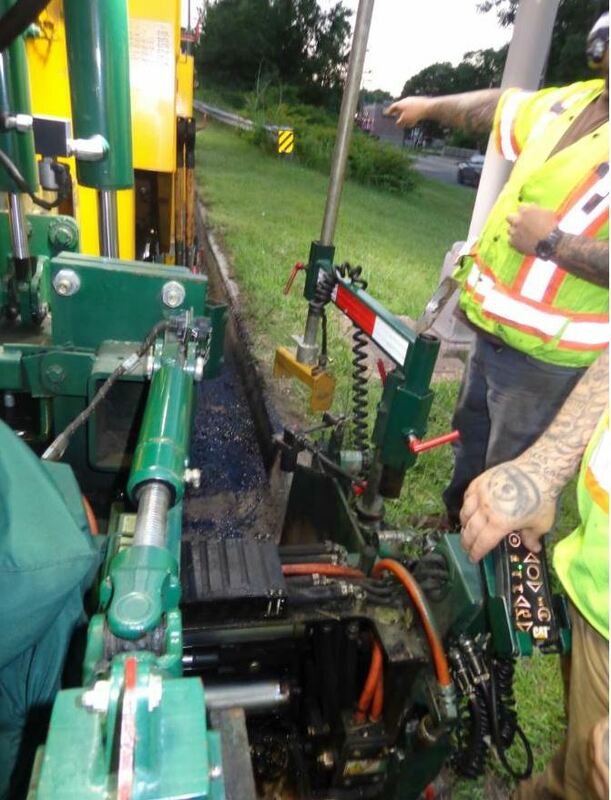 John Ball of Top Quality Paving, Manchester, New Hampshire, teaches us that as a general rule of thumb, you’ll have no more than 5 or 6 inches of space between the pre-strikeoff and the auger blade. But don’t forget that your auger chamber’s size should depend on the type of mix you’re running. John Irvine, president of Roadtec Inc., Chattanooga, reminds us that the auger should be set a distance from the back of the paver that is two and a half times the largest size aggregate in the mix. This is also true from the trailing edge of the auger to the face of the screed. This helps you get the auger as close as possible to the paver without crushing the rock.